In this episode, I interview Todd Bergin, also known as Todd.LIVE. He’s a live video and Instagram video expert. His course is called Instagram Live Podcaster. He’s also the host of the ‘Grammer School podcast and the Entrepreneur Live podcast. Todd shares tips for improving your content, video, audio, and lighting. You’ll also discover tactics for building your audience and repurposing Instagram Live videos. 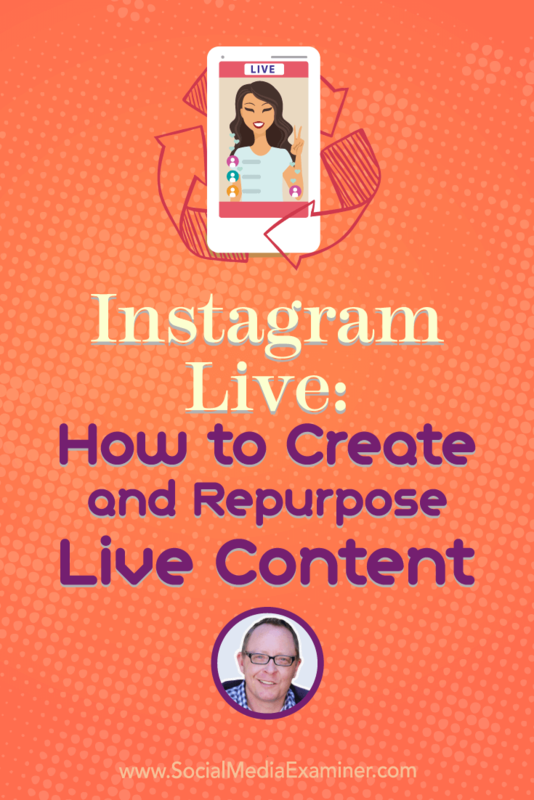 Instagram Live: How to Create and Repurpose Live Content featuring insights from Todd Bergin on the Social Media Marketing Podcast. Todd started his first business and developed a taste for entrepreneurship when he was 13 years old. Someone stole his bike, and his parents couldn’t afford to replace it. To make money, he started knocking on doors and making deals to mow lawns, rake leaves, and other lawn care jobs. After college, Todd tried a few different careers and businesses. In South Carolina, he owned a fresh market with 14 employees, but quickly realized that type of business wasn’t his calling. While he was in law school around 1998, he started selling items on eBay and Amazon, and followed the news cycle to determine what would sell well. By 2009, Todd had been practicing law for several years and started his first Internet-based business outside of eBay or Amazon. After he became interested in firearms, he needed aftermarket parts for a gun that didn’t work very well and found someone to make parts for him and his friends. That effort turned into a business that he still runs himself, sending things out about 2 days per week. Because that business has done well, Todd was able to quit practicing law and try other things. His wife was able to quit her six-figure job, too. Todd started other online businesses that didn’t work out but were good learning experiences. In fact, around 2015, one of those businesses, a business coaching company, naturally led him to live video and teaching people how to do it. 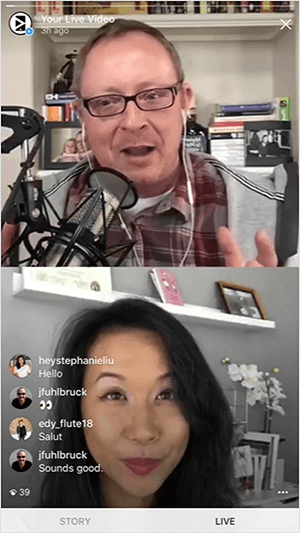 In the live videos Todd made to market his business coaching skills, he found himself talking more about how to do live video than how to become a full-time entrepreneur. He also realized teaching people how to set up a studio is easier. You can build a studio in a weekend, but a successful business can take years. A few live video pioneers further inspired Todd to pivot to live video coaching. When Todd was sick in bed with the flu, he watched Gary Vaynerchuk do a Super 8 (going live on eight platforms at once) for 8 hours to promote his book, Ask Gary V. Todd watched the whole thing and was inspired by how Gary reached people all over the place, had a lot of fun, and changed lives quickly. Vincenzo Landino was another source of inspiration. Early on, his live videos displayed lower thirds (text in the lower third of the screen). He also used a split screen to bring people on his show. Todd taught himself how to set up a studio that allowed him to go live on multiple platforms and use multiple computers using Wirecast and Switchboard Live. He also took a class to begin building his audio production skills. By the time Instagram Live showed up, Todd found it refreshing because Instagram makes it so easy to go live as a broadcaster and for viewers to find you. Since Todd began doing live video, he found that people spend more time on Instagram than YouTube or Facebook. People check Instagram while they’re in line at the grocery store or wherever they go. Also, Instagram has done a brilliant job of making it easy for everybody involved to create and find video on the platform. You basically just have to press a button to go live. Listen to the show to learn about Todd’s work with Jamie Masters of Eventual Millionaire. Part of what makes Instagram Live easy to use is its limitations. The no-frills broadcasting makes Instagram Live a talking head platform. On many other live video platforms, you can add graphics and share your screen. Instagram Live doesn’t have features that let you do any of those things. Also, to go live on Instagram, you have to use your mobile phone or a tablet. To show anything beyond a talking head, you have to figure out workarounds. To visualize this, Todd once showed a screen for a tutorial by placing two iPads facing one another. One showed the how-to, and the other broadcast the live video. Instagram Live video is also limited to an hour. At the 2-minute mark, a countdown appears at the top of your screen and then there’s a hard shut-off. However, Instagram has made changes that make watching a live video easier. At first, you could see the video only while it was live. 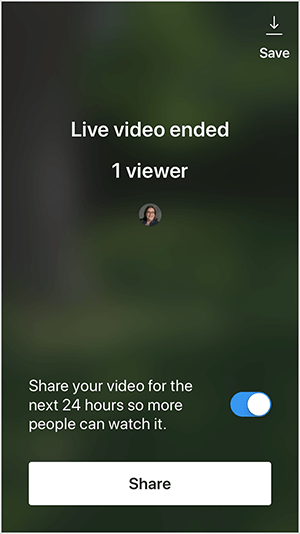 Now, the live video appears in your story for 24 hours. Sometimes, you can also save the live video to your Instagram highlights, but the save feature doesn’t always work. When Todd goes live as a solo broadcaster for 15-20 minutes, he sees an option to save the video. However, when he brings a guest into his live video, he’s never had the option to save. When Todd has saved a video, the quality is good. Listen to the show to hear my thoughts about publishing Instagram Live video to Facebook Stories. Instagram Live is an amazing place to make strong connections. Unlike elsewhere on the Instagram platform, live video is in real time. When viewers comment, you can respond immediately. Also, unlike photos in the news feed or stories, Instagram Live allows people to hear you speak and see your facial expressions so they can get to know you better. 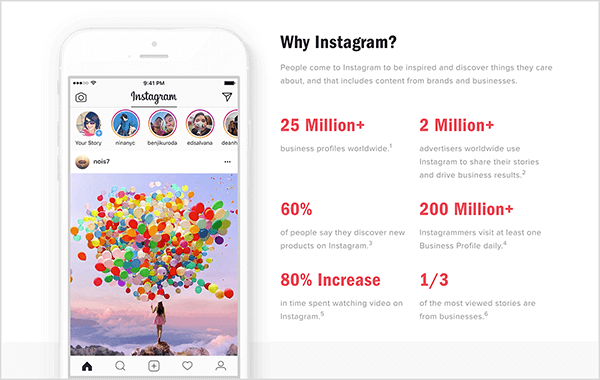 Instagram Live offers a great way to grow a following of valuable prospects because Instagram has fantastic rates of participation, and users tend to be conversational and spend their whole day on the platform. Also, when you go live, your followers receive a notification (if they have notifications turned on), and your avatar appears at the top of the mobile interface. If you host a guest (or are a guest) during a live video, you can extend your reach even further because both the host’s and the guest’s followers receive a notification. In this way, a bunch of people who may not know who you are can meet you and learn from you, making Instagram Live a great place to network. Listen to the show to hear my tips for getting started with live video. To start, Todd recommends going live often and consistently. Choose topics you think people will find interesting and connect with them on a regular basis. Beyond that, Todd recommends using a tripod, making sure your audio is clear, and finding a place with good lighting. Tripods: Stabilizing your phone with a tripod is very important for the success of your live video. For a stationary live video, you can set the tripod on a desk. A mini tripod is easy to throw in a backpack or the front seat of your car in case you need it. For example, Cowboy Studio makes a nice little mini tripod. When you set up your phone on a tripod, you need to be close enough to read the comments. If your location has interesting details, you can angle the camera to include some of these. If you invite a guest to your live video, know that the frame will change, and you often need to adjust your phone so you appear in the frame. Small table tripods make these adjustments easy. If your phone is leaning against soup cans, adjusting the angle is more difficult. Audio: Upgrading your audio can help your live videos stand out. Sometimes the onboard mic on your phone is fine. To illustrate, when Todd is in front of his house and there’s no traffic, the onboard mic sounds great. However, if he’s in public, he might use his Apple headset or a lavalier mic to upgrade the audio just a bit. When Todd uses the audio equipment in his podcasting studio for his Instagram Live video, he receives lots of compliments on the audio. So audio quality is definitely something people value. His podcasting setup includes a professional microphone that goes through a compressor and a mixer and other equipment that makes the sound really rich. Lighting: Good lighting is key on any live video, including Instagram. Daylight is sufficient. Inside, you might look toward a window if it’s not blinding you. To check your lighting, look at the preview of yourself before you go live. If the lighting looks too dark, go somewhere else. Lighting is as simple as that. Listen to the show to hear my thoughts about using Apple AirPods for audio. Todd shares several ways to repurpose live video. As the host of two daily podcasts, Todd has used Instagram Live to record interviews for his podcast. To do this, Todd records the interview externally with a digital voice recorder. To pump in excellent audio and record his guest, Todd had to figure out the right equipment and how to set up the connections the right way. To capture a good screen recording after a live video, first put your phone on Mute and Do Not Disturb. Then start recording the screen on your device. Next, play your own live video. You have 24 hours before the live video goes away. When you’re done, you can use an app to rip an audio file from your screen recording. 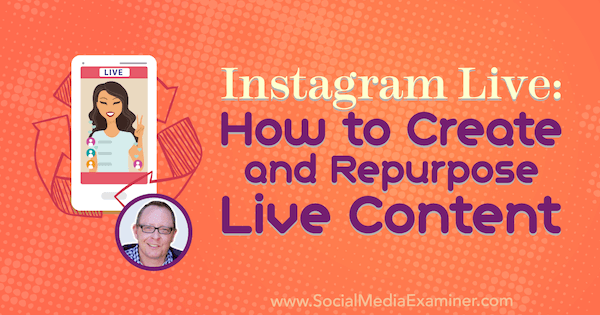 If you’re able to save an Instagram Live video to your phone, as discussed earlier, you can repurpose the video in a few different ways. First, you can re-upload the video to an Instagram TV (IGTV) channel. To repurpose the saved video for YouTube, you can shrink the vertical video and add a background card with a lead magnet. Or in Adobe Premiere, crop and edit a video with a guest so one person appears on the left, and the other on the right. If you turn the saved video into a square video, you can post it on any social media platform. To turn vertical video into square video, Todd likes the mobile app Squaready for Video. With a separate video editor, you can create a 1-minute clip from your live video, use Squaready to make the clip square, and then share the clip in your Instagram news feed right away. Listen to the show to hear my thoughts about the Screenflow app. To help people get started with talking head videos, Todd shares several ideas and examples. Chris Strub, one of Todd’s favorite creators, does a lot of walk-and-talk live videos. Todd finds that walk-and-talk videos get a few viewers very engaged, which keeps the video going for up to an hour. To do a walk-and-talk video, you can be anywhere and talk about an experience. For instance, Chris did one when he was having a bad day and then had a problem with his tire. However, the people at a tire dealership went over and above to help him. His video took place in the dealership parking lot, and he talked about how the employees made him feel. By the end, he was in tears. The video was moving and is one of his most successful videos, which Todd and Chris discussed on one of Todd’s podcasts. For people who aren’t sure what to discuss on live video, Todd emphasizes that fluff sells. People like to hear day-to-day, routine stuff in addition to commentary and discussion on your mission and passions. If you’re at a restaurant that serves only Pepsi and you want Coke, you can get great mileage from a conversation like that. 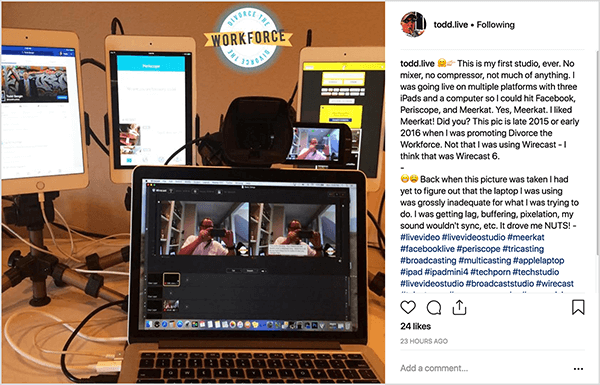 At Social Media Marketing World last year, Todd spent a lot of time at the live video tables and people kept saying they didn’t know what their message should be. 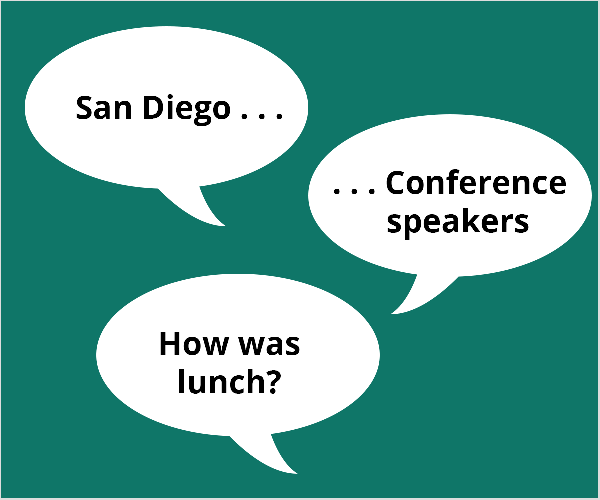 When an attendee was wondering about topics, he learned she’d never been to San Diego or the conference before. So he suggested she talk about San Diego, speakers she heard at the conference, and even her thoughts on lunch. Todd emphasizes that your live videos don’t need to be a planned research project. You can just hit the button and start talking with your friends. After you go live a few times, you start to get the hang of it. Listen to the show to hear about Todd’s experience going live with an attendee at Social Media Marketing World. 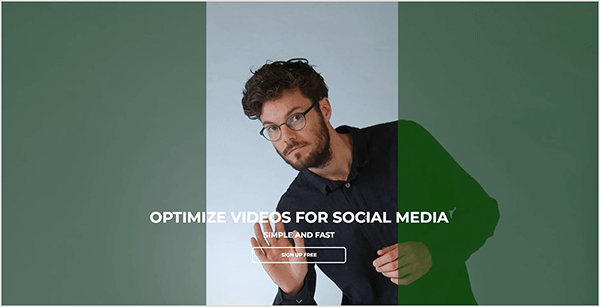 With Crop Video, you can upload landscape video to the browser-based video editor, crop it perfectly for vertical or square video, and export your cropped video. The cropping works so well, Crop Video can be a huge timesaver when you need to create vertical videos for IGTV. After you upload a video, Crop Video uses its face- and object-recognition capabilities to automatically split the video into shots. Then you can adjust the cropping shot by shot so your vertical or square video looks its best before you export it. Crop Video is also great for creating video for Instagram Stories, which are limited to 15 seconds. Instead of exporting an entire video as one long video, you can set in and out points so you can export 15-second clips of the cropped video. This way, you avoid the problem of Stories cutting off a video that’s longer than 15 seconds. You can try Crop Video for free, but the free version limits you to one shot without a watermark and restricts the size, length, and export quality. In the next tier, you pay about $9 and get access to the tool for 24 hours without any of the limitations placed on the free version. So you can do a bunch of work within a 24-hour time period. Full access to the tool anytime costs about $50 per month. Listen to the show to learn more and let us know how Crop Video works for you. Visit Todd’s website to learn more about him. Follow or message Todd on Instagram. 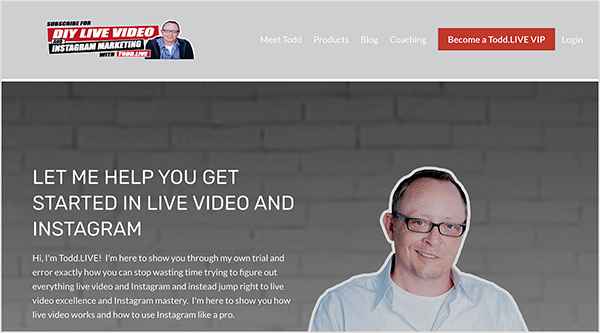 Check out Todd’s Instagram Live Podcaster course. Listen to the ‘Grammer School and the Entrepreneur Live podcasts. Watch Gary Vaynerchuk do a Super 8 to promote his book, Ask Gary V.
Learn more about Vincenzo Landino. Discover how Wirecast and Switchboard Live can help you produce professional live videos. Find out more about Instagram’s fantastic rates of participation. 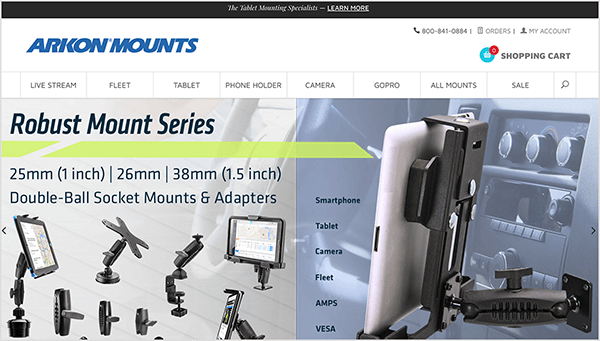 Stabilize your mobile device with mini tripods from Cowboy Studio or Arkon Mounts. 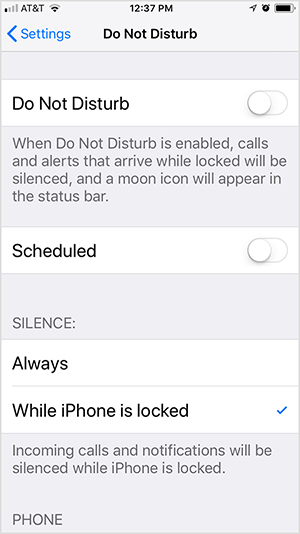 Learn how to use the iOS built-in screen recording feature. Find out how recent Android Pie security upgrades limit mic access and test screen recording apps for Android. Discover more about cropping and editing video with Adobe Premiere. Create square videos from your Instagram Live with Squaready for Video. Listen to Todd’s Entrepreneur Live podcast episode with Chris Strub. Turn landscape video into square or vertical video with Crop Video. What do you think? What are your thoughts on Instagram Live? Please share your comments below.